I’d love to say that I’ve always loved pickled fish in curry, but the truth is I only discovered it in my twenties! When I first moved to the Cape. And like any foodie who discovers Cape Malay cuisine for the first time, I was hooked! Actually no, more like instantly addicted. So much so that I’ve turned this Bo-Kaap delicacy into my own personal Easter tradition. Eating kêrrievis (fish pickled in curry) with hot cross buns at Easter is originally a Cape Malay tradition. The very idea of it always makes me smile when I find myself in France at this time of year. Thinking back on those early days when I first opened JAN, I remember how I had to keep cutting back on the spices I used in my dishes until I found that perfect balance that would intrigue the delicate French palate without offending it. So, when I think of scoffing down a bowl of kêrrievis with its sweet, tangy and liberally curried notes, and inviting a super-cinnamony hot cross bun to the party, I think of the looks I’d get if I had to serve this at the restaurant. Taste explosion comes to mind. Like any form of pickling, the idea behind this dish stemmed from a need to preserve food, but as an Easter tradition, this particular fishy dish is a bit of a cultural paradox. Although the Cape Malays are a Muslim culture, they’ve somehow established eating pickled fish with hot cross buns as a Good Friday tradition. But the part that always warms my heart is that, as with so many Cape Malay dishes, it has brought South Africans from all walks of life together. Typically, the firm flesh of a yellowtail makes for great kêrrievis, but I found that the soft, flaky flesh of a baby hake is really great at absorbing the juices of the pickling liquid. On that note, you have to let the fish marinate in the curry for a minimum of three days. Trust me, it’s just so good! The best way to have kêrrievis is with a generously buttered hot cross bun (or three), but if you find yourself without one, fresh warm bread comes a close second. Preheat the oven to 200 °C. 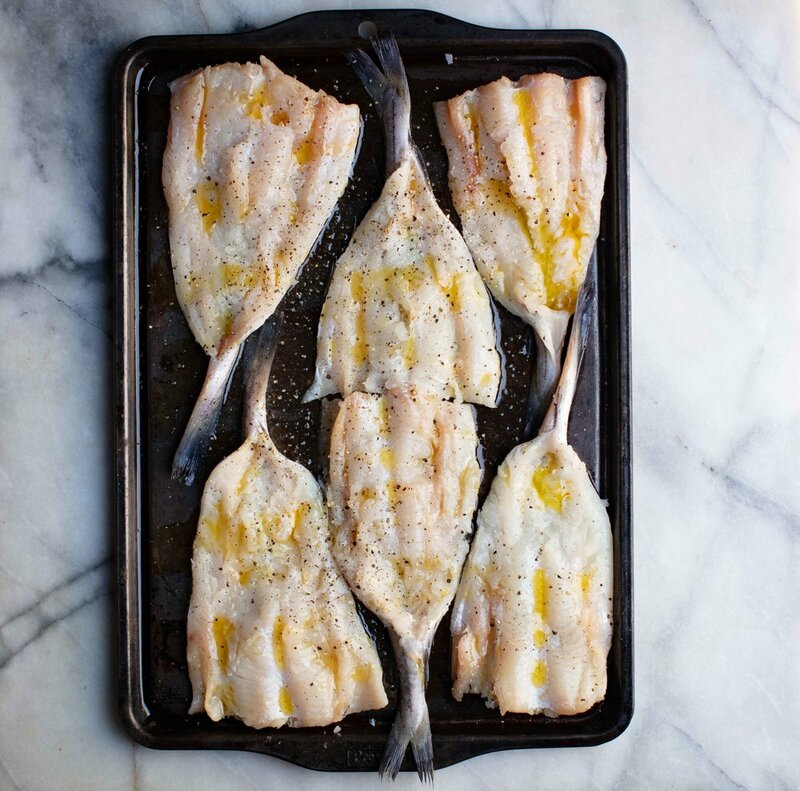 Place the baby hake on an oven tray drizzled with olive oil, skin side down. Drizzle some more olive oil over the fish and season with salt and pepper. Bake the fish in the oven for 8 – 10 minutes, and then take it out to cool. Heat about a tablespoon of olive oil a saucepan. Add the sliced onions and fry for 5 minutes. Add the curry powder and turmeric and fry for another 5 minutes. Add the all spice berries, bay leaves, sugar, vinegar and water. Mix it through and cover the saucepan with a lid. Let it simmer for 10 minutes and remove the lid. Then, let it simmer for another 10 minutes. Meanwhile, halve the peaches and remove the pips. Heat a little olive in a saucepan and fry the peaches on both sides until soft. Add the fried peaches to the curry sauce. Place the fish in a ceramic dish and spoon the peaches and curry sauce on top. Cover the dish with foil and place it in your fridge. It will be ready to eat in about 3 to 4 days.